Among its greatest efforts, PORCELANOSA Group and KRION® aims to make its products increasingly sustainable and more environmentally friendly. Part of this effort is the development of the products of the Ecocycle® range, which includes all products from the different KRION® series which contain recycled material. In the production process of the Ecocycle® colours, accredited by SCS Global Services, certifying that KRION® offers a range of colours which contain pre-consumer recycled material, meaning that material recovered from the waste flow is used in the manufacturing process to create the final product. 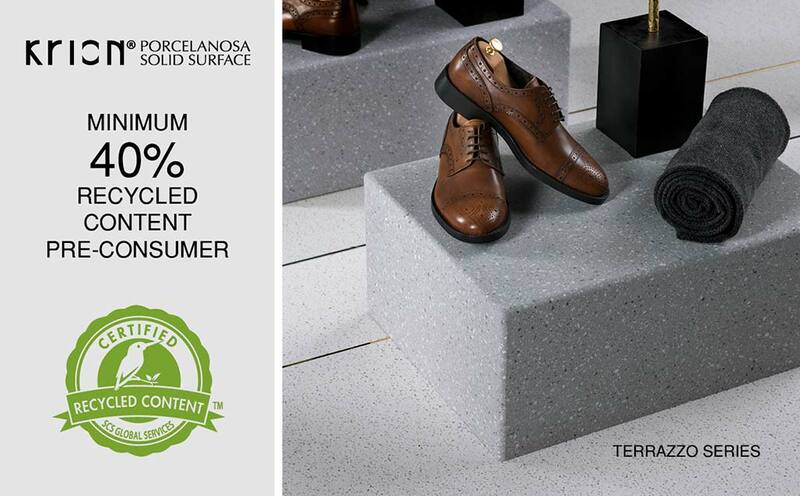 We are proud to be able to inform you that the new Terrazzos Series has obtained the SCS certification for using a minimum 40% of recycled content. The current range of KRION® products with recycled content is made up of 33 colours, divided into four types of certifications issued by SCS Global Services: 6%, 12%, 20% and 40% minimum recycled content. Social commitment is a factor which KRION® has adopted since it began, and thanks to this, construction professionals can even benefit from 2 LEED® points with the use of the Terrazzos Series.